What can we say about Roger? He is an infinite well of talent and his repertoire of shots is indeed limitless. Many of the points in the match were played at a furious pace with both players trying to dictate from the base line with the difference being Roger’s ability to move forward and towards the net to apply pressure on Nadal. Both had quite a few chances to break in the first set, however Nadal couldn’t capitalize on any and Federer eventually converted one of his many at 4-3. The match was riddled with numerous inside out forehand and down the line backhand winners by Federer and by the end of the third game in the 2nd set Federer already had 21 winners to Nadal’s 11! Roger took the balls early, stayed aggressive with his backhand and kept drawing Rafa out of the court with his cross-court angled backhands, something that Rafa was so used to doing to Federer in the past. In fact at 2-3 Roger closed for 3-3 with yet another cross court backhand drawing Nadal way out on his backhand side. There was a sting to Roger’s Inside out forehands and cross court backhands today and Nadal felt the pain ever so often. The sizzling cross court backhand at 30-30 and 3-3 gave Roger another break point which Nadal saved at the net but Federer was relentless with not just the backhand but also the backhand returns of serves. Federer’s aggressiveness was at full flight in important points such as 30-30 or break points. He punctuated his net approaches with stab volleys, came up with good serves when needed, and an exquisite down the line back-hand return of serve at break point won Roger his only break for 5-4 in the 2nd set. The backhand closed the deal yet again for Roger. A down the line backhand winner to end a rally at 0-15 in the last game of the match showed just how well Roger was executing his backhand. Taking the backhand really early even at the risk of hitting too many half volleys. Hitting and not slicing the backhand, thereby applying relentless pressure on Nadal from the backhand side and forcing him to play to Roger’s forehand more. Going for the shots, and not holding back, which is obvious from the 29 winners that Federer hit to Nadal’s 15. Moving inside the baseline and approaching the net whenever he could to apply even more pressure on Nadal. Always staying aggressive and dictating with the serve, return of serve, backhand and forehand. Flattening forehands and backhands whenever possible. As a result, and in the end, Federer’s controlled aggression earned its 3rd back-to-back win against Nadal in 2017 . 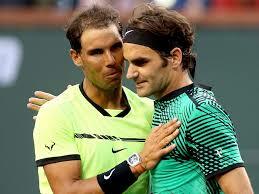 ← Roger v/s Rafa — Who will win? I appreciate your analysis. Only thing I would add is that Roger’s new mental attitude is allowing his game to flow. The mental game is perhaps the most important. There are at least a dozen matches in their storied rivalry, even on clay, where it was close at key moments and Roger’s talent, hard work, and repertoire of shots were definitely enough to win. But mentally he’d overthink those moments and simply try to do more with the forehand resulting in bad errors, or safely bunt the ball back into play to avoid such errors. The former is an entire discussion about good vs. bad errors; the latter resulted in Rafa having lots of time to take control of a point. I also think the mental factor is the greatest difference maker. He would hold back esp. against Rafa on clay. Now he’s forging ahead and it’s paying off big time. He’s always had the goods to handle him, it just took a better backhand to give him the confidence to be aggressive. But better late than never, we’ll take it! Go, Roger, go! And now he moves into a whole new category of records: oldest player to accomplish x event, ranking, you name it. He’s not done yet making his mark on tennis history, not by a long shot. God save the King! I think there is a new element of ‘wanting to win’ rather ‘not wanting to lose’. In the past, especially against Nadal, Federer often resorted to protecting himself.. .protecting his backhand… playing safe… wait for a chance… don’t make a mistake… don’t give away the point and the match. But now it’s like he doesn’t care about the result all that much, as long as he’s doing it on his terms. He wants to play the best he can, and if he ends up losing as a result of a few misses, he’ll be okay with that. I’d also add that Federer has another gear he can throw his game into…and Nadal hasn’t got that anymore. A crosscourt backhand would draw Nadal out on his FOREHAND side. How about you watch that point again.